When it comes to greens and veggies, I personally find it tastes best when it’s raw because of the fresh crunch and natural flavors so it’s no surprise that whenever I get a side of curtido in its little plastic baggy with my pupusas it always reminds me that this is a fantastic slaw to just have around the house all the time because it is light, easy to make and only slightly pickled so you can eat it all the time, anytime. Curtido is very easy to make, and oddly not very easy to find in stores where I am from. It usually isn’t sold at restaurants as well because it is usually served as a free side or topping so I decided to put together this recipe so it can be enjoyed anytime in a snap. 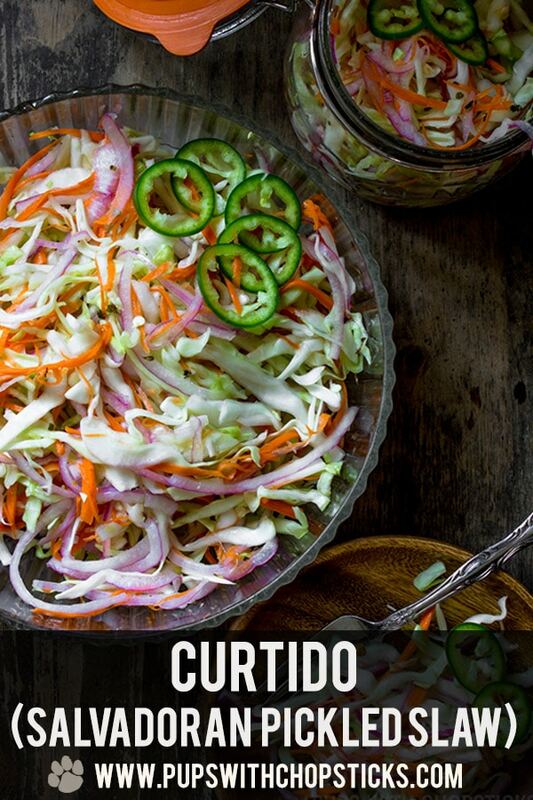 For this curtido recipe, you can find all the ingredients at your local grocery store. Although the recipe calls for Mexican oregano, you can substitute it with oregano as well. I find Mexican oregano a lot more intense and has a spicier kick than regular oregano so the substitution will not be exact but still flavorful. Curtido With A Twist? Switch Up the Cabbage! If you follow along, you’ll know I love traditional recipes but I also love adding twists to recipes as well. Traditionally, curtido is made with green cabbage but I have tried using Asian nappa cabbage for this recipe and it works just as well! The main difference between the two cabbages is texture. I find nappa cabbage a bit more leafier and lighter so the slaw has a bit less crunch but it absorbs the brine quicker from it’s soft leaves. 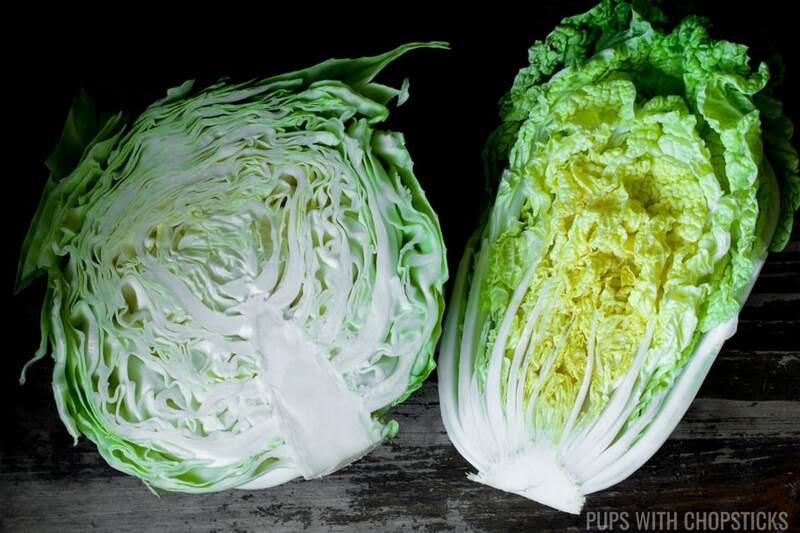 Nappa cabbage also has a hint of sweetness to it as well, and it comes through in the slaw. 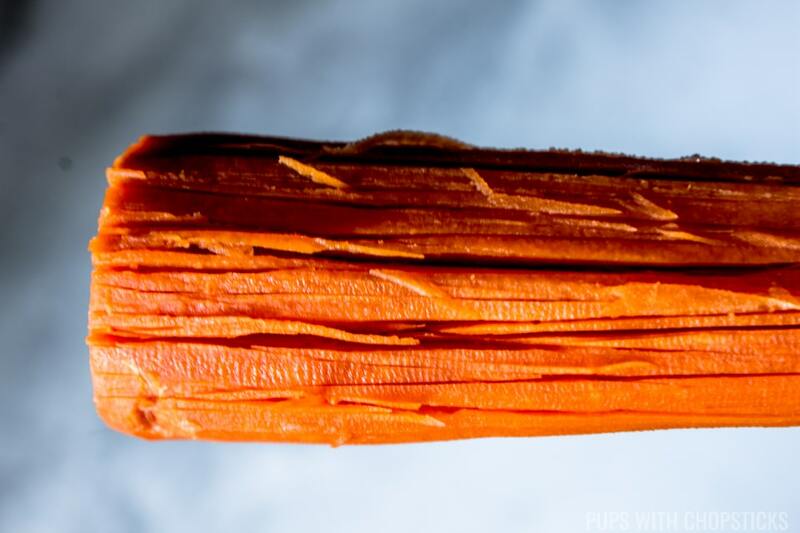 One of the most tedious tasks in the kitchen is cutting carrots into thin slivers, especially when you don’t have a mandolin since carrots are usually so tough to cut through. Thankfully there’s an easy way to do this, and you don’t need a mandolin – you just need a knife and a vegetable peeler. Basically after I peel a carrot, I lay it down on the cutting board side ways in front of me. 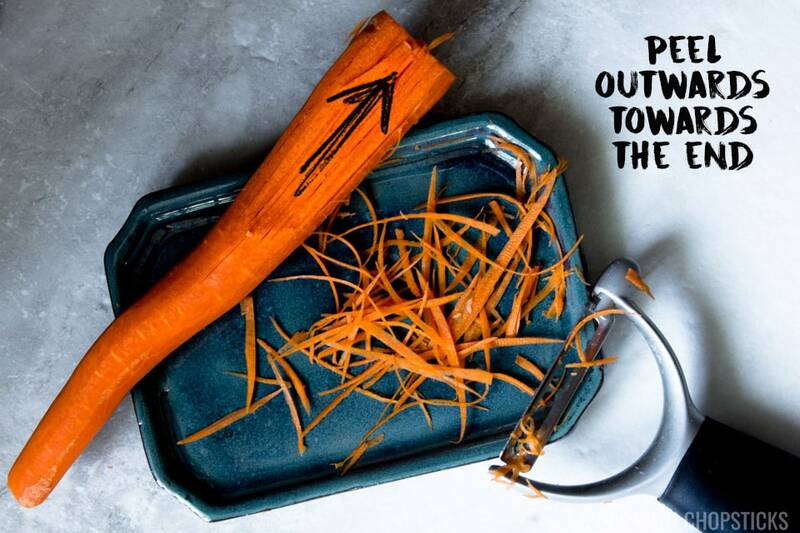 I put my hand on the thinner end of the carrot to hold it down and take my knife and roughly make random hacking chops at the thicker end of the carrot, careful not to do it too hard – your goal is to make slits on the carrots but not cut all the way through. 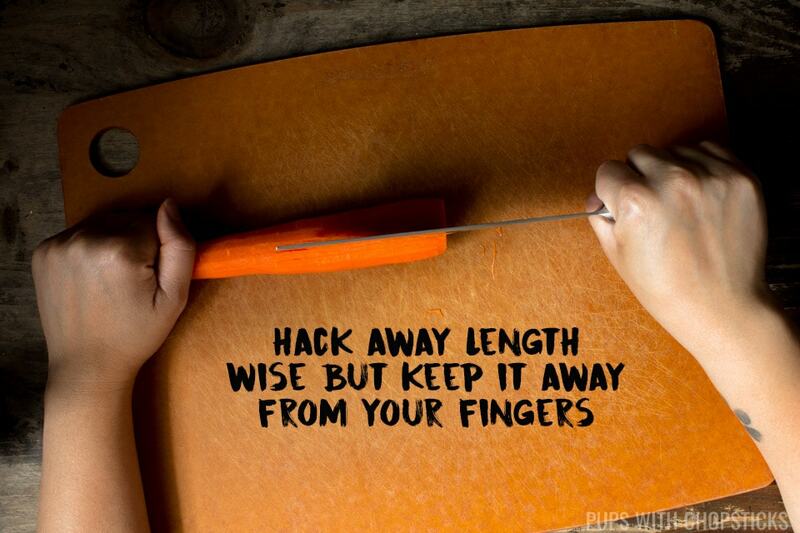 Make sure your fingers and hands are no where close to where you are hacking away at the carrot. Once you get a decent amount of hacks in, run the vegetable peeler down the cuts and voila, you have slivers. Repeat the process until it is difficult to peel the carrot and cut the rest by hand. My Magic Curtido Ingredient? Hot Water! When you layer the onions at the very top of the bowl and pour hot water over it, it cooks the onions slightly so it removes that harsh raw onion bite, which balances out the flavors in this curtido. 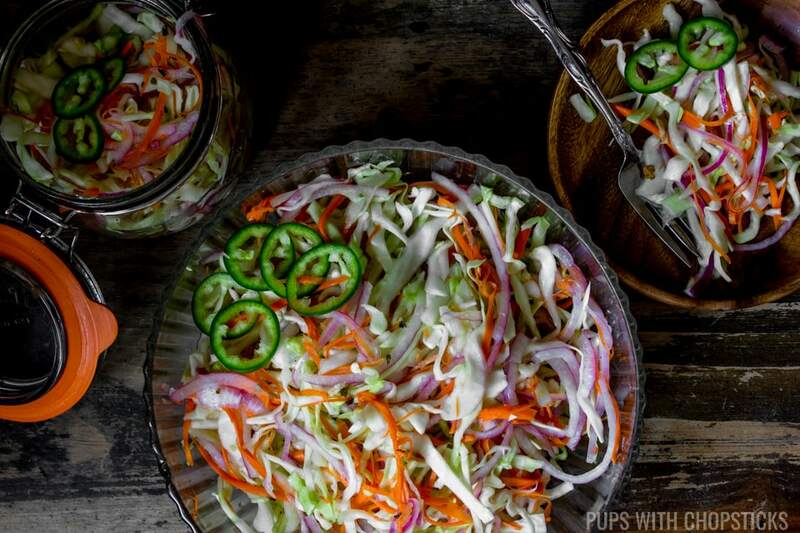 The cool thing is, since the onions are very slightly cooked, it brings out the natural sweetness in them as well which works beautifully with this slaw. When you are putting this together, don’t worry if it looks like there is not enough brine. 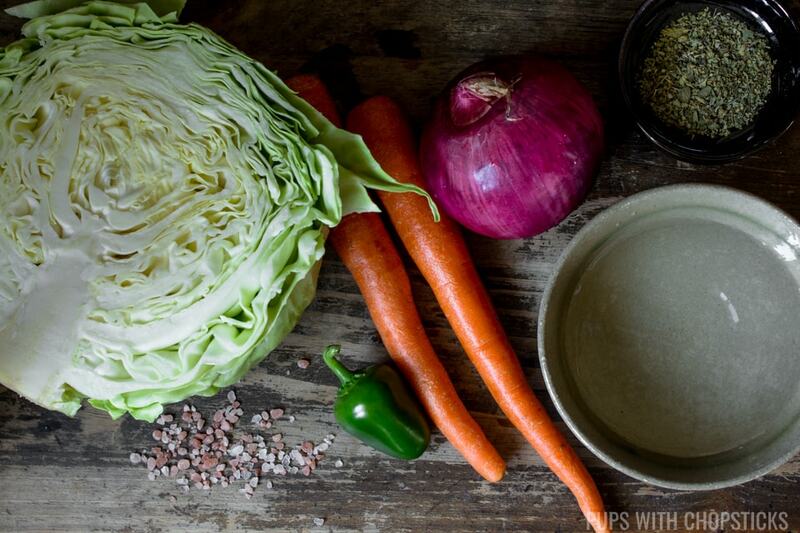 While you are mixing the slaw with your hand (and you should use your hand), give the cabbage a few firm squeezes to bruise the cabbage – this will not only soften the cabbage more quickly and the salts will also draw out the water from the cabbage which will give you more brine. 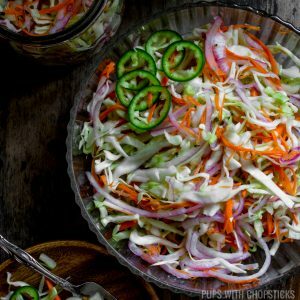 A quick and easy, lightly pickled cabbage coleslaw (curtido) that can be eaten as-is or served as a topping with tacos, pupusas, burgers, soups etc. Thinly slice the cabbage and put it in a large bowl and clean it by dunking it in cold water a few times. Add the carrot slivers to the bowl with the cabbage. 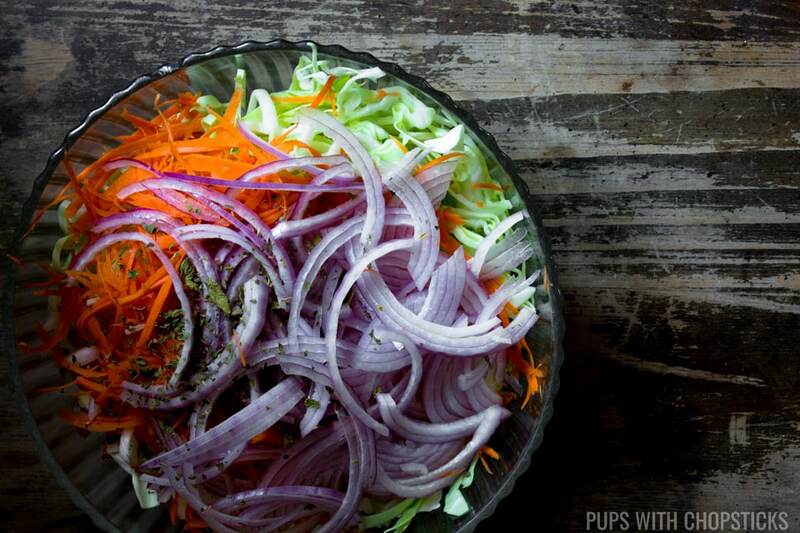 Peel and finely slice the onion and place a layer at the very top of the bowl on top of the carrots and cabbage. Sprinkle the salt and oregano over the onions. Add the white vinegar and wait approximately 1 minute or until the mixture is cool before you start mixing everything together. I find the best tool for mixing this is your hands. The cabbage will feel very stiff in the beginning and it will look like you do not have enough brine at first. 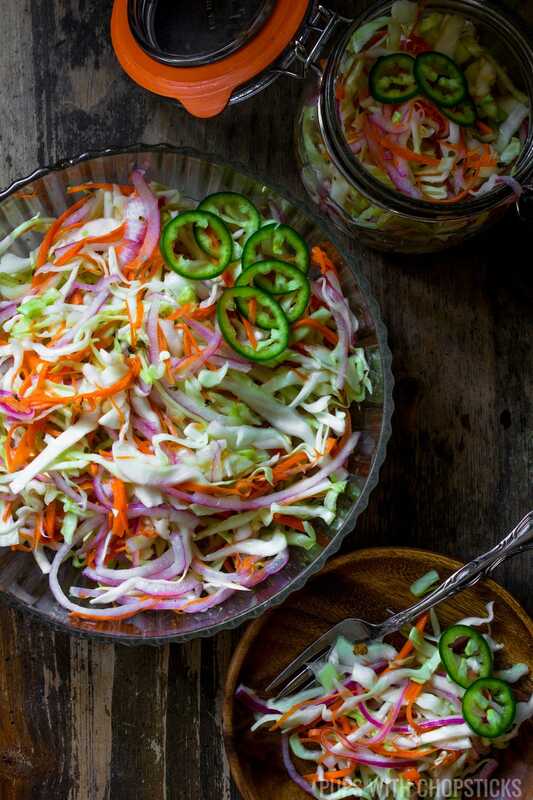 While you are mixing the slaw together, you should use your hand and give the cabbage a few firm squeezes. This will release some water from the cabbage and soften it faster. It will look like there isn’t enough brine before you start mixing everything together (before the salt draws out the water from the cabbage) but in case you plan to jar it and you need more brine, the brine can be easily doubled. Storage life of this slaw is a week. I find keeping the onions at the very top so that the boiled water slightly cooks it gives the onion less of a sharp raw onion kick and makes the slightly sweeter. I use hot water not boiling water. If you are heating your water from a kettle let it sit for 5 minutes to slightly cool it before pouring it over the slaw. Seriously delicious! I think I could eat this straight! I put it on smoked pulled pork tacos and it was AMAZING!! I generally hate anything pickled but since this was lightly pickled it was perfect! Thank you so much for sharing! YESSS TO ALL THE CURTIDO. i had pupusas from a taco truck the other and added so much curtido to my plate that my friend thought i was just free-loading the veggies lol. Beautiful rainbow salads ! I bet all nutritionist like to see this dish of different colors of veggies — our body needs rainbow colors of foods full of minerals and nutrition … no matter how you cook,. Ha, though quite a lot of chopping preparation work, but it’s very healthy (keep you stay slim). That trick with the carrot reminded me of a similar way in which my mom chops the onion. And she does it in the air, over the pot! Whoa that’s really cool! Moms are awesome haha! I think I’d be paranoid of chopping my fingers off over the pot! haha!